Women hold up half the sky but not at Shani Shingnapur? Shani Shingnapur temple continues to be on the boil over the issue of barring the entry of women to the inner sanctum. It is indeed an avoidable controversy and it highlights the need for the traditional-minded temple authorities to shift to 21st-century thinking. It is not that women are altogether prohibited from entering the temple. As per the tradition, women are not allowed to gain entry into the inner sanctum (an open-air platform) of the temple, where the rock idol of Lord Shani is installed. But still this is unjust and as the Bombay High Court has stated in its verdict, “if men were granted entry to a place of worship, women should enjoy access too”. 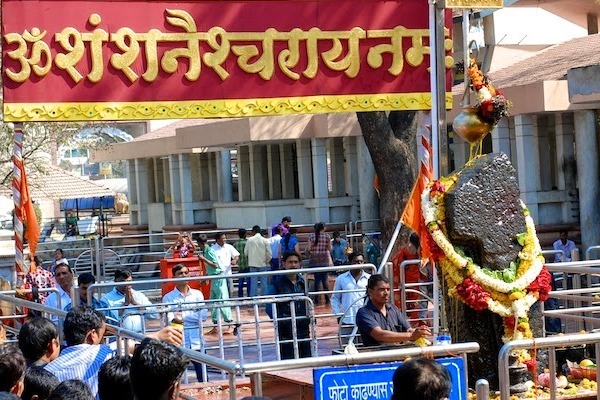 Shani Shingnapur controversy – an attack on Hinduism? Some people opine that this temple activism is a conspiracy to intervene in the Hindu spiritual affairs and view it as an onslaught on the Hindu way of life. However, their fears are ill founded. Hinduism is so ancient and yet ever renewing. It is like a perennial river which continues to flow even after the innumerable efforts made by the invaders, who followed the Abrahamic faiths, to destroy it. The Hindu shrine, Somnath, stands as an enduring example of the Hindu legacy which has the capability to withstand even the most brutal onslaughts. Is Hinduism averse to reform? Unlike the Abrahamic faiths, Hinduism has always been receptive to reforms. It is mainly because of its unorganized structure where the dominance of the clergy is almost nil. There is no pope or grand mufti who can issue edicts or fatwas. Of course, there are ‘swamijis’ but they don’t issue fatwas and even if they issue no one cares. Hindus jealously guard their right to choose whom to worship, how to worship and when to worship. And that is the reason why Hindus can even worship Saibaba of Shirdi, a Muslim fakir, and deify him as an incarnation of Lord Vishnu. Hindus are in fact inventing new Gods and Goddesses almost on a daily basis and their penchant for inventing new Gods will continue till eternity. No doubt Hindus practice many blind beliefs and useless practices that impose an unnecessary financial burden on them. However, they don’t allow any clergyman to intervene in their religious affairs. And this unorganized nature of Hinduism makes it the most receptive to reforms. Hinduism underwent many reforms. Sati, devadasi and untouchability are some of the social evils Hinduism by land large could eradicate. However, still there is a lot to be done like ending discrimination against Dalits and the empowerment of women. Though untouchability has largely been eradicated, discrimination against women and Dalits is still prevalent in many parts of the country. Why are women not allowed into the sanctum of Shani temple? Hindus believe that Lord Shani wards off evil from them if they keep him happy with their offerings. Mustard oil is believed to be the most loved offering Lord Shani accepts. However, only men are allowed to offer mustard oil to Shani Deva as it is believed that the wrath of the deity is less on women and they are largely unaffected by Shani. In other words, Lord Shani is benevolent towards women and they need not make any offerings to please him. But Trupti Desai and the members of her activist brigade want to enter the sanctum and offer mustard oil to the presiding deity. If they want to unnecessarily enter the sanctum and carry out an unnecessary ritual, let them do it. Why the temple authorizes are trying to prevent them? There is no restriction whatsoever on the entry of women into most of the Hindu temples. However, Shabarimala and Shani Shingnapur temples are the rare exceptions. The temple authorities give out many reasons which are actually unreasonable. As the saying goes, women hold up half the sky. Any discrimination against women or any attempt to reduce them to the status of second-class citizens is abhorring and must be condemned outrightly. Even the Hindu nationalist organizations like RSS have condemned the barring of women from entering these two temples. There are many Hindu nationalists who trash the women’s organizations as agenda driven and accuse them of being the instruments in the hands of foreign NGOs who are trying to defame Hindus and bring disrepute to the Modi government. They also point out to the fact that these women’s groups never raise the issue of discrimination against their fellow women in other faiths, especially Islam. It is a fact that the status of women in Islam is pathetic, but any effort to bring about reform without the explicit consent of the Muslim clergy will be resisted violently by the Muslims and it will create a law and order problem in the country. Muslims, especially Maulanas are very rigid as far as their religious beliefs and practices are concerned and they feel that their religion, being ordained by God, is unalterable. However, Hinduism does not believe in any such dogmas, and it is useless to compare the discriminatory practices prevalent in Hinduism with that of the practices in other faiths. Irrespective of the intentions of the women’s groups, Hindus should be receptive to reforms and all the meaningless and discriminatory customs and traditions prevalent in Hinduism must be done away with immediately. Any delay in introducing reforms and any efforts to resist the attempt to bring about reforms will only strengthen the anti-Hindu forces. The left liberals will utilize this resistance to reform as a stick to beat Hindus and Hinduism. The Christian missionaries, who try 24×7 to convert Hindus to Christianity, will get an added impetus to their proselytization efforts. Irrespective of what left liberals or Christian missionaries say or do, it is indeed unjust on the part of Hindus and Hinduism to allow any discriminatory customs and traditions against women and Dalits to continue. This entry was posted in faith and tagged entry, Hinduism, Shani Shingnapur, temple, women on April 2, 2016 by Dr. Ramachandra Reddy.